A practical solution to sharing the parenting of your children after splitting up. Divorce changes a family but it doesn’t end a family. So it might be helpful for you to step back from your current situation and think about things from a different perspective. Successful shared parenting may be a new concept to you but it is central to bringing up happy, confident, well-balanced children. Successful shared parenting is related to how well you communicate and work with your ex-partner for the best interests of your children. You are unique, special and individual in your family style so what works for another family may not work for you. This plan is designed to help you work out for yourselves what will work easily and positively for your family - helping you move forward easily through this time of change. • How can my ex-partner and myself remain actively involved in the life of our children? • How do I manage parenting our children if we can’t agree? • Who should make the daily decisions? • Who should make the major decisions? Imagine for a moment a perfect world -one where parenting your children is easy, respectful and working really well. What are you doing? What are you saying? What are you feeling? What is your ex doing, saying, and feeling? What are your kids doing, saying and feeling? What small changes would you need to create to make this perfect world a reality? What would be the benefits to your family if you started to make these small changes? How would your life look, sound and feel like now? Research has shown that children tend to adjust to divorce or separation with less difficulty if they are able to maintain the close family relationships that were important to them before the separation, and if their parents are able to co-operate and be generally supportive and respectful of one another afterwards. 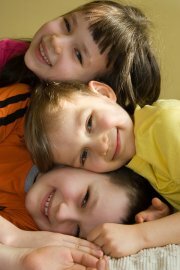 What is a balanced and reasonable amount of time to spend with your children- weekly, monthly, yearly? What is a reasonable amount of time to have them during the holidays - Easter, Summer, Autumn, Christmas? it be shared and flexible? Who has the children for birthdays and special occasions? How can you keep everything business-like- by making appointments, keeping your feelings in check and writing everything down. Who has the children at weekends - how many a month - does it include a Friday night? Do the children spend time during the week with each of you - how could this be arranged with school activities and homework? How can you agree on major school decisions? How can you agree on the religious upbringing and traditions for your children? How can you pass information between you regularly so each parent feels involved and informed in school and sporting activities, parents evenings, or other social events? How do you arrange shopping for clothes? Who pays for what? - phone calls, mobile phones, pocket money, child support? What consistency will there be between households in - homework routine, bedtimes, TV watching, discipline, coming home times? What about medical or special health issues - who makes the decisions? Who picks the children up from school in an emergency? How often do the children see their grandparents? Where do you go for help if communication seems to breaking down? What happens if one parent moves away? What happens if one partner re-marries? How can you handle the changes? How can you introduce new partners to the everyday tasks of shared parenting? How can you compromise on different ideas and routines from each other?